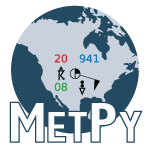 MetPy is a collection of tools in Python for reading, visualizing, and performing calculations with weather data. MetPy follows semantic versioning in its version number. With our current 0.x version, that implies that MetPy’s APIs (application programming interfaces) are still evolving (we won’t break things just for fun, but many things are still changing as we work through design issues). Also, for a version 0.x.y, we change x when we release new features, and y when we make a release with only bug fixes. We support Python >= 3.6 and currently support Python 2.7. We are dropping support for Python 2.7 in the Fall of 2019. For more details and rationale behind this decision, see Python 2.7 Support. For questions about MetPy, please ask them using the “metpy” tag on StackOverflow. Our developers are actively monitoring for questions there. If you use MetPy in a publication, please see Citing MetPy. SciPy 2017 poster and repository about reproducing a classic CAPE paper with MetPy. MetPy is available under the terms of the open source BSD 3 Clause license. We want everyone to feel welcome to contribute to MetPy and participate in discussions. In that spirit please have a look at our code of conduct.